She has a secret to keep. But will she give her heart away? Lucy Banning may live on the exclusive Prairie Avenue among Chicago’s rich and famous, but her heart lies elsewhere. Expected to marry an up-and-coming banker from a respected family, Lucy fears she will be forced to abandon her charity work and squeeze herself into the mold of the well-dressed wife who spends most of her time and money redecorating. When she meets Will, an unconventional young architect who is working on plans for the upcoming 1893 World’s Fair, Lucy imagines a life lived on her own terms. Can she break away from her family’s expectations? And will she ever be loved for who she truly is? Get swept away into the lavish world of Chicago’s high society as Oliva Newport brings to life an age of glitz and grandeur, stark social contrasts, and one woman who dares to cross class lines for what she believes. Chicago on the cusp of the 1893 World’s Fair opening is a city brimming with excitement and possibility. Lucy Banning, one of Chicago society’s most privileged daughters, finds herself in the center of this social whirlwind, torn between familial expectations and the alluring promise of furthering her education and the chance to use her social position to make a difference. Acquiescing to the family pressure to marry long-time childhood friend Daniel, a banker with a promising career, Lucy agrees to the engagement but postpones definitive wedding plans, secretly attending a class at the newly-opened University of Chicago and working at a local orphanage, the former a secret she’s desperate to keep as higher education is viewed as a wholly unacceptable occupation for a well-born lady destined for a society marriage. After meeting a poor but promising young architect, and developing a most unconventional friendship with Charlotte, a new maid in the family household, Lucy realizes she can no longer even maintain the pretense of wanting the future society and her parents expect her to crave. But flying in the face of convention brings unexpected risks to her doorstep — risks that could threaten her dreams and everyone she holds dear. Unfortunately, despite the promising setup and rich historical background, Lucy’s story falls short of its initial promise. The novel clocks in just shy of three-hundred pages — and while something can be said for brevity, in this case the apparent determination to deliver a fast-paced novel results in multiple plot holes and awkward transitions between scenes and time jumps. One example involves a much talked-of outing to an art exhibit relating to Lucy’s university course — the planning, the secrecy goes on for roughly the first hundred pages — only to have the experience relegated to a brief recap after the action occurs. Pivotal, allegedly life-changing conversations are rarely, if ever, seen on the page, only joined or recapped following the tensest moments “off-screen.” Moments such as these build up the tension in the narrative, promising a critical scene or conversation that is rarely, if ever, delivered, leaving the storyline disjointed. There’s also the issue of character development as regards the titular heroine. While Lucy possesses an admirable desire to test social boundaries and a worthy heart for those less fortunate than herself, the means by which she seeks to accomplish otherwise worthy aims are less than admirable. The level of secrecy and falsehoods she engages in as regards her educational endeavors in particular seem especially excessive, the reaction out of step in comparison with parents who prove, in the end, to be amenable to change when confronted with the truth. There’s also the issue of a complete lack of romantic tension regarding Lucy’s budding relationship with Will, the architect. Their “romance” is poorly developed with no real tension or development — it’s a foregone conclusion from the moment they first meet, despite Lucy’s engagement at the time. Charlotte, the new maid, is a better-realized character, her past shrouded in secrecy and her attitude and response to circumstances seem in particular in-step with the times. I did enjoy the growth of Charlotte and Lucy’s cross-class friendship, and I’m sufficiently invested in Charlotte’s story to look forward to Newport’s second Charlotte-centric Avenue novel, due to release in January. 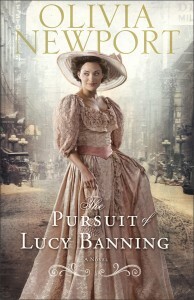 With a setting replete with fascinating history and tapping into the public’s fascination with stories exploring the lives of the extraordinarily wealthy and those who made a living as their servants, Newport’s first Chicago-set novel contains a wealth of possibilities but falls short of delivering on its promise. With greater plot development and more polished characterizations, the Avenue of Dreams series possesses real potential as a compelling American-esque glimpse into a glittering world lost to history. Ruth is an avid reader and lover of all things BBC. You can read more of her reviews by visiting her blog at http://booktalkandmore.blogspot.com.